I usually have the hardest time feeding Dexter these days. He is so independent and he would rather feed himself. That wouldn't bother me so much if it wasn't for the fact that feeding himself = LOTS more laundry for me!! He loves peanut butter but will only eat it by himself of off a spoon (why not sandwiches?!?!) Thanks to Revolution Foods, I found something that works!! 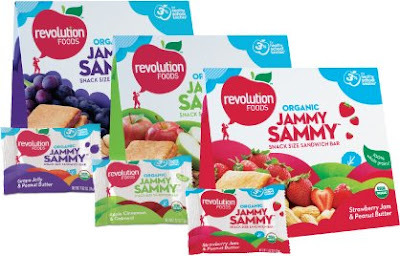 Their Jammy Sammy is a snack size twist on a lunchbox favorite. Each yummy bar is made with nourishing ingredients that help kids have more sustained energy throughout the day. And each one is individually wrapped and ready to go – perfect for when you’ve gotta jam. Dexter got his Jammy Sammies and he loved them. He liked all the flavors equally (PB & Strawberry, PB & Grape, Apple Cinnamon & Oatmeal). I think he liked the PB & Strawberry the best though! I was happy to feed them to him because they are made with 100% whole grains, organic fruit spread and they DO NOT contain HFCS (high fructose corn syrup, transfat or artificial ingredients!! If you are looking for a break from the mundane while feeding your children, look no further than Revolution Foods,. Service : Customer support turned out to be good. Young lady on the telephone had a enjoyable approach on top of that We obtained cash super-quick. Value :I were given wonderful value considering that payday loan interest rates have been completely noticeably very competitive.